You are here: Home / The ShadowFax Story. It was March 1981, and, the year before, Coca Cola had entered into its biggest involvement with the sport to date with sponsorship of the Coca Cola 800km race at Sydney’s Oran Park. Coke has had previous contacts with the sport but this was a whole new level. The race was for Prototype bikes (pretty much free-for-all), Unlimited Improved Production (like a modern superbike) and Production bikes. There was a huge entry and everyone who was anyone was there, including Wayne Gardner, riding the NCR Ducati. But my story concernes a privateer entry and it’s possibly just as entertaining. Mates from the CRRC decided that they wanted to enter a bike in the 800. 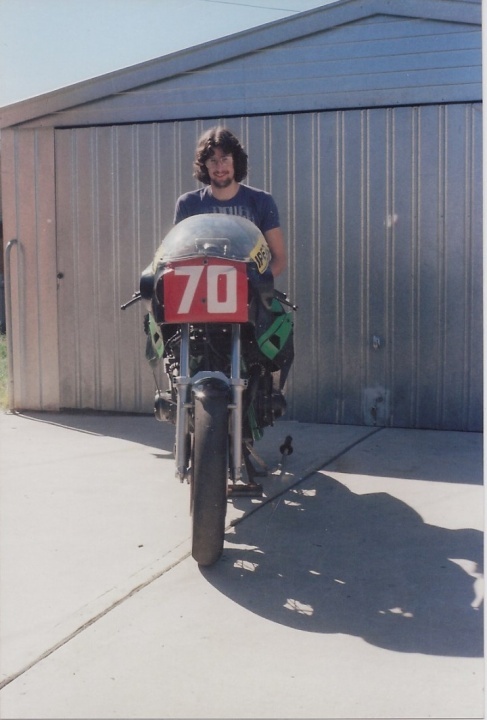 Neil Keith owned a Z1 Kwaka and the other guys put in all the money that they could afford and “bought” shares in the bike. Budget racing. Night after night was spent fettling the thing in both Rick Miller’s and Kent Miklenda’s garage, fuelled by quantities of alcohol, and take-away foods of dubiuos provenance. Rick did the engine, Neil did the fabrication and Kent did the bodywork (at least that’s how I remember it, it was 30 years ago). From the chaos emerged possibly the ugliest bike to ever grace a grid. I have some photos which I will scan and publish, but my scanner is busted at the moment. Some “sponsorship” was secured from IPEC, and from Robbos Motorcycle Wreckers in Canberra as well as Koppers Logs, the landscaping people. Despite Rick’s best efforts to keep the team on task (it was a losing battle, really), everything got left to the last minute and it was touch-and-go if they would make it to the track, let alone to the grid. 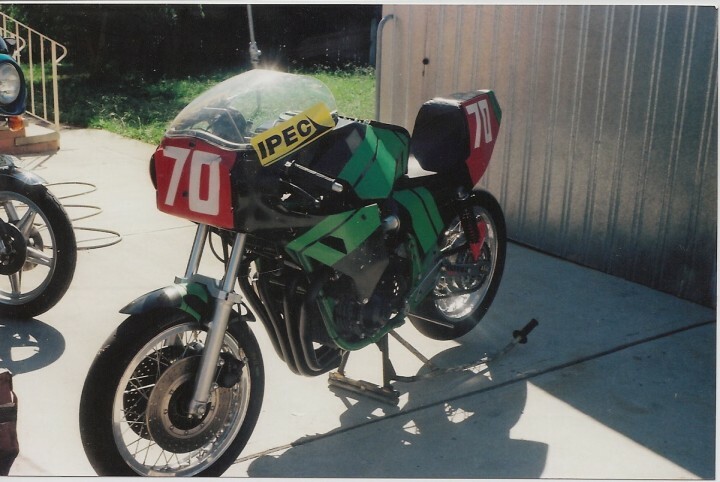 So an unregistered, unlit and totally illegal bike was “run in” courtesy of a mad blast up the Hume Highway from Canberra to Narellan in the early hours of Saturday (Practice and Qualifying) morning. I can’t remember where the team qualified but I think they were quite a bit faster than they thought they would be (it was dry on Saturday). Come Sunday and the rain was hosing down. Kent took the first stint and, by dint of riding carefully, got the bike into the top 10 by the time the first pit stop rolled around. 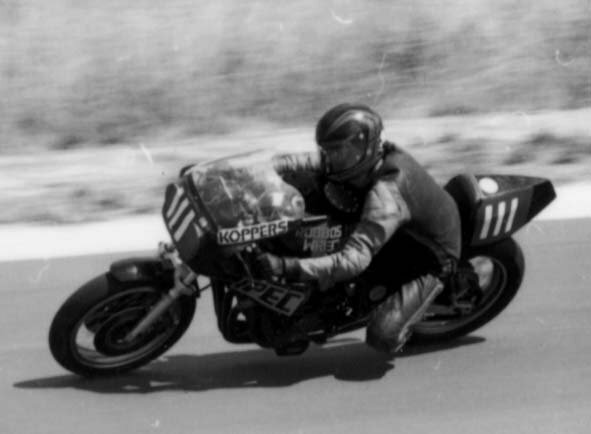 Now Rick had strictly told both the riders that they would have to ride carefully in the left-handers because, despite the bike being entered in the Prototype Class which would have allowed them to saw the alternator off altogether, money had been tight and that hadn’t happened. Now the standard trick in those days was to remove the alternator and cover the hole with a metal plate. But the Shadowfax still HAD an alternator and the alternator cover was very subject to damage in left-handers. Rick had filled all the space inside the cover that he could with Araldite, but somehow he knew that it wasn’t going to be enough. Sure enough, as soon as Neil’s stint began, he went crazy; carving through the field at vastly faster lap thimes than those that Kent had been doing (well, it WAS substantially his bike, after all). Long before his stint was due to be over, the Shadowfax was back in the pits with the alternator cover worn through and oil leaking everywhere. Appeals went out over the PA (I know, I was announcing so it was me who did it) as the bike sat idle in the pits and the race went on. Finally, someone in the crowd offered the alternator cover from their road bike so that the team could get back in the race. Under strict instructions to take it easy and get to the finish, Kent and Neil lasted the distance (not 800kms as the race was shortened due to time constraints and the gathering gloom), crossing the line in 13th place, a sensational effort for a “slung together” effort. But, it was a false dawn. Examination of the Supp Regs revealed afterwards that, to be considered as a “finisher” they needed to have covered a certain percentage of the laps coverd by the leaders, and, despite heroic riding and teamwork, they fell a handful of laps short of achieving that goal. It was a bitter disappointment for all concerned. Here’s Kent onboard the bike at the March 1981 Canberra Road Closure meeting at Macarthur Park. He won the “C” Grade race by nearly a lap. The bike was later destroyed in a high-speed accident at Bathurst’s McPhillamy Park; rebuilt as a road bike and finally retired from those duties in the late 1990’s. It was passed on to me, in bits, and is in my back shed, waiting till I have enough money and enough time to restore it to its former glory. 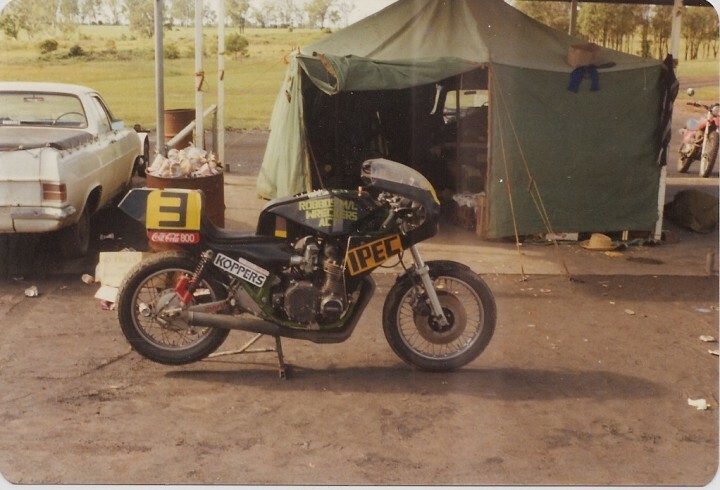 Here’s the bike ready for the trip to Bathurst, Easter 1981. Unfortunately, it ended up looking like this. The rider was a bit worse for wear, too. I think the word is “bent”. Yesterday I noted a new user registered on the site and, while I didn’t recognise the username, the email address jumped out of the page at me. It was the company name that Kent Miklenda used to use when he started his graphics design company about 20 years ago. Too coincidental for words. So I flashed back an email and asked if it was Kent and, sure enough, it was. He was kind enough to fill in lots more details for me and I reproduce his detailed reply below. So, here is the ShadowFax story “from the horse’s mouth” so to speak. 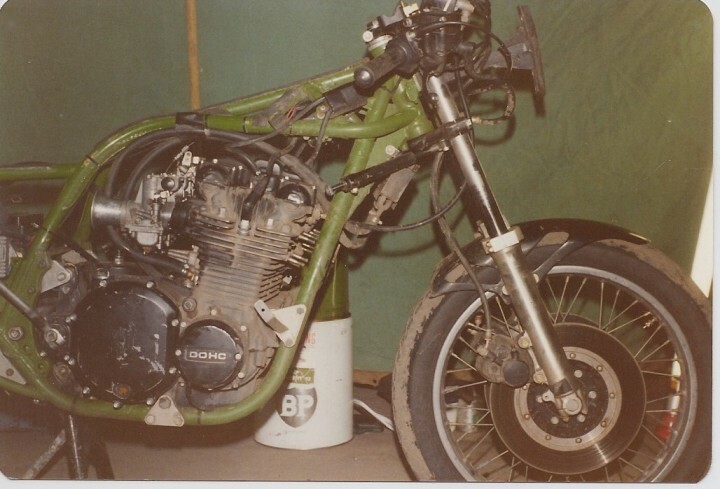 Now the Shadowfax beast was actually built from a wrecked Z1-R that I acquired at Robbo’s and which Grahame Houghston then straightened out and modified with plenty of trick welding and extra tubes. 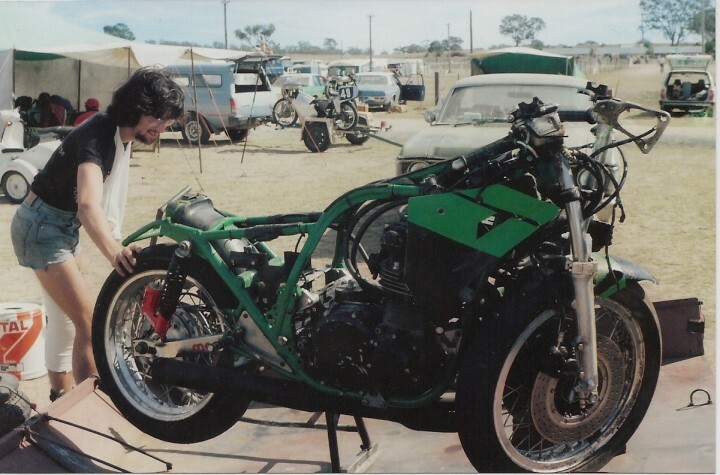 Of course later it developed into the full blown Moriwaki 1105 version under Rick’s supervision. The triple clamps were made at the nuclear physics reseach lab machine shop at Canberra Uni, and another part for the rear brake at the Royal Australian Mint (both ‘foreign jobs’). The revolutionary bodywork was created in my garage at …ermm…Wanniassa I think. Please note the so-called ugly ‘diamond’ shape tank design is pretty much standard on big bikes these days although admittedly somewhat more elegant ! ;-)) Also at that time there was no frame shape to rationalise such a design, it was simply my visionary status as a designer (chuckle…;-) I was also influenced by the slab-sided Godier-Genoud Le Mans 24 hour bikes that were around at the time, especially their no-break refuelling systems which I kind of alluded to by placing a large circular plate with bolts around the circumference on the tank, but in that case it was actually the access hole to enable me to join the 2 halves of the fibreglass tank from inside. In the Coke 800, after Neil ground through the alternator cover and we borrowed a new one (thanks 😉 we indeed didn’t complete enough laps as we timed my ride to be the maximum allowable (there was a rider time limit), although in hindsight I should have just taken the bike out when it was ready and done the rest of the race all in one go. I did collect a little plastic ‘finisher’ trophy but we never made it onto the official finisher’s list. Later, when I rebuilt the bike after the Bathurst koala blender horror road crash at McPhillamy Park (apparently some guy took out my back wheel as I slipped under him while overtaking on an A-grade suicide line rather than a C-grade whimpy line) I used it as my road bike. You know, just your average F1-Prototype ex-racer sports-tourer. 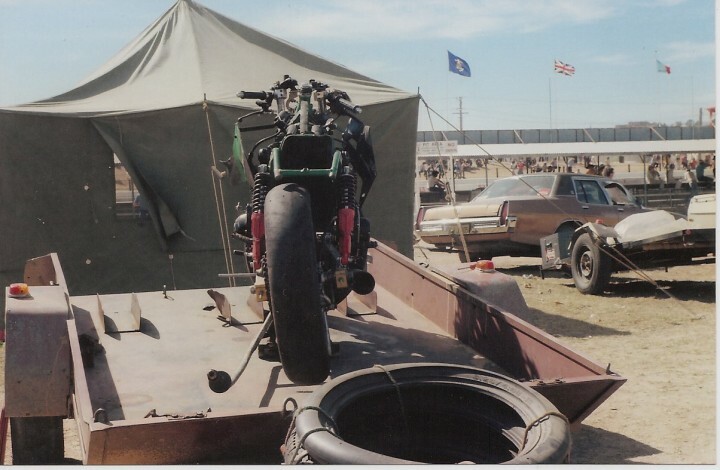 Many people would joke it looked like it was from Mad Max 3 (which hadn’t been made back then). Funnily enough I am involved in the film industry now and work as a freelance producer for the special effects company who is supplying the 3D cameras for Mad Max 4 ‘Fury Road’, which is in pre-production right now. 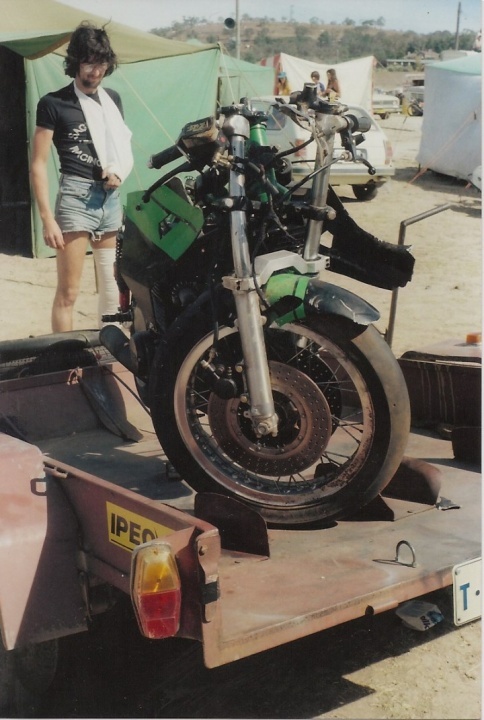 I sure remember those days fondly but have pretty much given up bikes for now as old racer habits die hard and it’s no fun riding a decent performance bike on the road anymore as one tends to be paranoid about the old license. In 1995 I rode my ZX-9R around Europe for 25,000 km and finally appreciated why such bikes are built (they are called variously Autobahns, Autoroutes, and Autostradas… 😉 I once was abused by an Italian in a yellow Ferrari for riding in the fast lane at 265kmh and getting in his way ! Hope life is good, and thanks for putting down your memories so eloquently. Certainly brings back powerful memories for me.